Well, that was a bit of an extended break. I well and truly fell off that Slimming World bandwagon didn't I?! I last updated in November and it was quite the downward slope from then. It got to the point where I had loads of things going on and it just became harder to stay on track, which also gave me a good excuse to eat that extra bit of chocolate or choosing to have a starter at a meal out. I also found it really hard to stay up with my exercise once the clocks went back and it was dark when I got home. I know if I really wanted to stick with it I would have done but never mind, I had a really enjoyable festive period but it's time to get myself sorted and reach my goal which I was getting to. You won't be surprised when I say I did put a little bit back on, not loads, 6lbs to be precise. But that's fine, it could have been worse. So, my first week back on Slimming World has given me a nice loss of 2lbs which I'm really pleased with. I've put together a bit of a plan with dates of what I'd like to weigh and when. I think these little goals will keep me focused. I have loads going on over the next few months which is making me save like crazy and not have much of a social life which is great for me right now! I can stay focused and on plan 100% which is exactly what I want. I also have my summer holiday booked for July which is when I reach my end goal, if not before then. Again, it's nice to have something to focus on. Getting back in to my routine with SW hasn't been difficult at all and I've actually really enjoyed it. I think my body had been craving loads of fruit and vege and it's thanking me for it. My sleeping was awful over Christmas/first week back but I'm pleased to say I'm getting full uninterrupted nights which is brilliant. I also feel more alert and have loads more energy in the day, even If i'm ready for bed at 8pm! I blame this time of year! My breakfast has been fruit with fat free natural yogurt during the week and I'm back to just having bread at weekends. For lunch I'm back on my quiche which I still really like. There's some soups from Iceland which I'm going to pick up for something different. Evening meals have included things like turkey melts, jacket potato and prawn egg fried rice. I started running again this week and it's become even more apparent it's something you just have to stick with and not quit. I feel like I did when I first started months ago. In just 2 months I can see/feel a massive decrease in my fitness and it's horrible, I honestly hate it. But i'm going to stick with it and hopefully get back to where I was. I'm also back to my weekly Pilates class on Sunday too which I can't wait for. Favourite meal last week? I really enjoyed prawn egg fried rice. Learnt anything new? You just can't beat fresh fruit and vege, healthy body = healthy mind is so true. Aims for this week? Keep my syns as low as possible and stay on plan 100%. Any new dishes to try? I picked up the new SW magazine last night which I've not looked through yet but I'm sure there will be something in there I'll try. I want to get back posting recipes on here again too! Time active? 50 mins, i'll be better next week. To see my previous 13 weeks on Slimming World please click here. 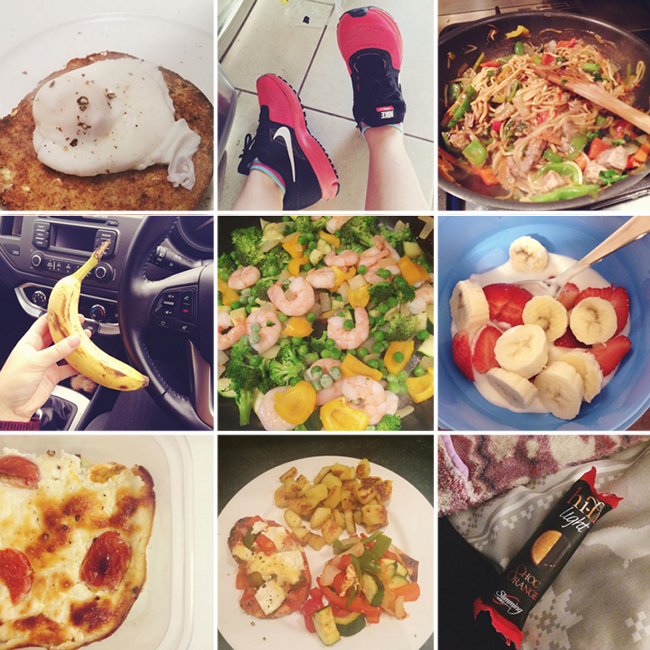 You're definitely inspiring me to get back on my get healthy wagon! Why is it so hard though!? Ahhh thank you so much for this! I've just spent 15 minutes reading their blog. It's amazing!